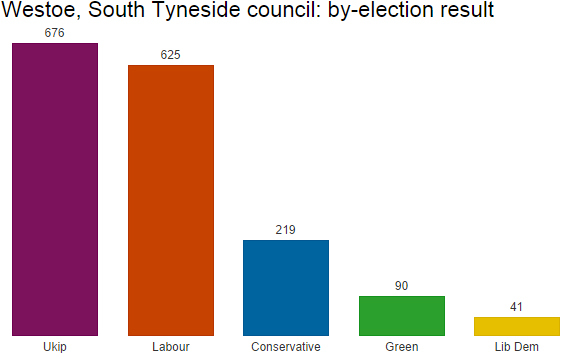 Only one of this week’s seven council by-elections saw a seat change hands – and it was a gain by Ukip. 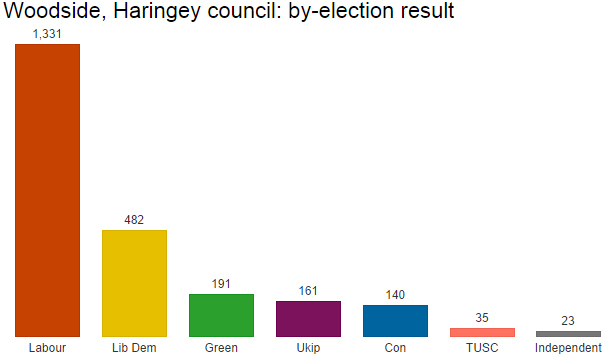 Ukip’s victory increases their presence on the council from one to two. The swing from Labour to Ukip was 4.9%. In the six other by-elections, Ukip did less well. The party didn’t field any candidates in two of the contests, both in Windermere and both of which saw big swings from the Liberal Democrats to the Conservatives. One was for a seat on Lib Dem-run South Lakeland council (9.5% swing); the other for a seat on Cumbria county council (15.6%). In both cases the Lib Dems held the seat. Windermere is within the Westmorland & Lonsdale constituency of Lib Dem president Tim Farron. These results won’t be the best of news for him as he heads off to Glasgow for his party’s annual conference. The swing may suggest the party has an outside chance of defending international development minister Lynne Featherstone’s marginal Hornsey & Wood Green constituency at the election – though my instinct is that Labour will take the seat with ease. The three remaining by-elections were in Cardiff, where Labour held a seat, and South Northamptonshire, where the Tories held two. OK, now that is blue!